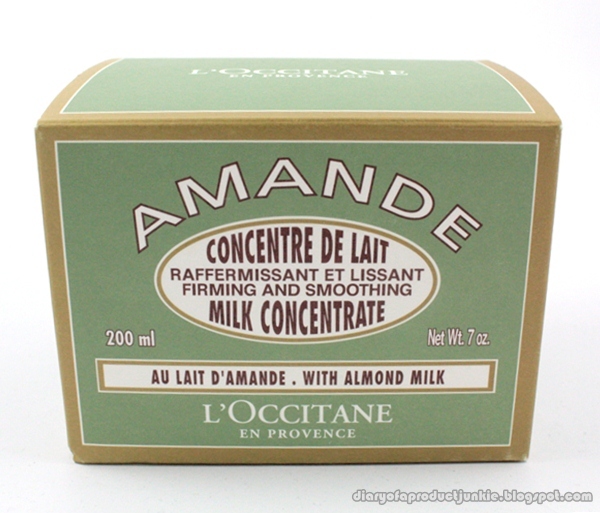 Hello, lovelies~ I was introduced to L'Occitane by my best friend when we went to Plaza Senayan for our dinner date. 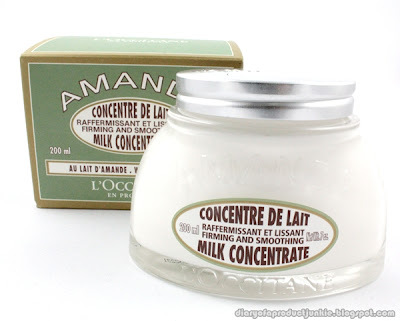 She raved about the milk concentrate from the Almond line saying that it's good for people with dry skin. So, we stopped by the store and I picked up the Amande Milk Concentrate. The product came with a separate box that has a pistachio green color with a brown color along the edges. On the front of the box, the product label is inscribed with the weight of the product in ml and oz. At the back of the box is the description of the product and the list of ingredients. Meanwhile, the product itself is packaged in a glass jar that is oval shaped with a tin lid on top. This product uses sweet almond oil as one of the moisturizing ingredient for the skin, along with glycerin as one of the humectants. It also utilizes sweet almond protein which may help to firm the skin, making it tighter and firmer. I found no irritants in this body lotion, so that's always a plus in my book. 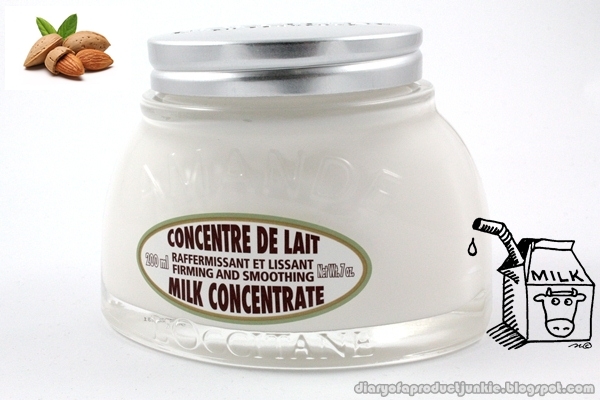 If you look closer, there are no parabens present in the milk concentrate. For preservatives, it uses phenoxyethanol. When I first sniffed the scent in the store, I was taken aback at how delicate and calming it is. It was a combination of a milk and almond scent, that slightly sweet. It was one of the type of scent that is relaxing to my senses. 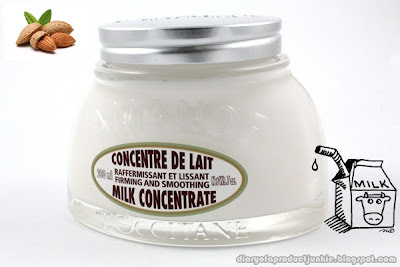 The texture of the milk concentrate is more of a cream than a lotion. 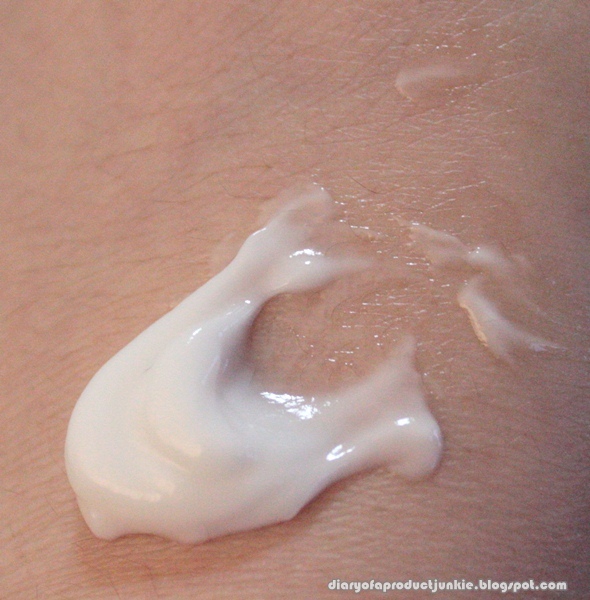 It is a white cream that sinks into the skin easily and rapidly, leaving a non greasy residue. It hydrates the driest parts of my body, i.e. my legs. The cream lasts all day in terms of moisturizing especially on my legs. Probably because it gets protected most of the time by my pants and are rarely exposed to water. This has been my current body cream favorite because I have been using it all day. That says a lot of a body product if I use it all day. The moisture is retained for a long time on my legs, making them feel so moisturized and smooth. It is expensive retailing at Rp 645,000 per 200 ml, but I'm willing to fork out that much if it is such a good product. I hope you enjoyed this short review and I'll see you in my next post.